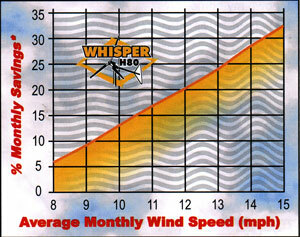 For Low To Moderate Winds! 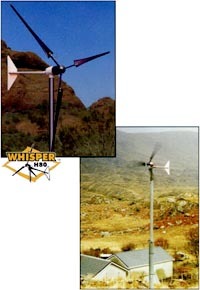 To get the most out of low to moderate wind speeds (up to 12 mph), the Whisper H80 is the turbine of choice. 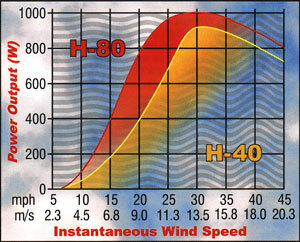 Featuring a ten-foot (3 m) rotor diameter, the H80 will deliver twice the power in marginal wind areas than the H40. In a 12 mph average wind (5.4 m/s), expect 200 Kw/h per month to your batteries.